In short, at least once a year (sometimes more if heavy use) and ideally in the Spring just after you have finished using the appliance. This is for all wood burning/multi fuel stoves, open fires, gas fires, oil appliances, AGAs and Rayburn flues and biomass appliances.
" I haven't used it much since the last sweep so I don't need it done this year" Sorry, that's like saying "I haven't driven many miles in my car this year, I don't need an MOT"
We don't just clean your chimney for you. Any fool can push a brush up a flue, and there are a few of those about. We are assessing your flue for deterioration, safety and correct operation. Just like the rest of your house, flues develop problems which, if discovered, can be dealt with before the Winter so you can have a fire in safety. If you are having soot fall down (particularly when it rains or hails), cold air downdrafts, the sound of birds or twigs dropping down the flue then don't delay in calling us, it wont get better over time. We can get you sorted before bigger issues develop. A word on chimney liners. If you have gone to the expense of getting a stainless steel flexi liner fitted to your stove or open fire why leave potentially corrosive tar and soot deposits in it from winter to winter. You wouldn't leave your car dirty in a garage all year and clean it just before using it in the bad weather. 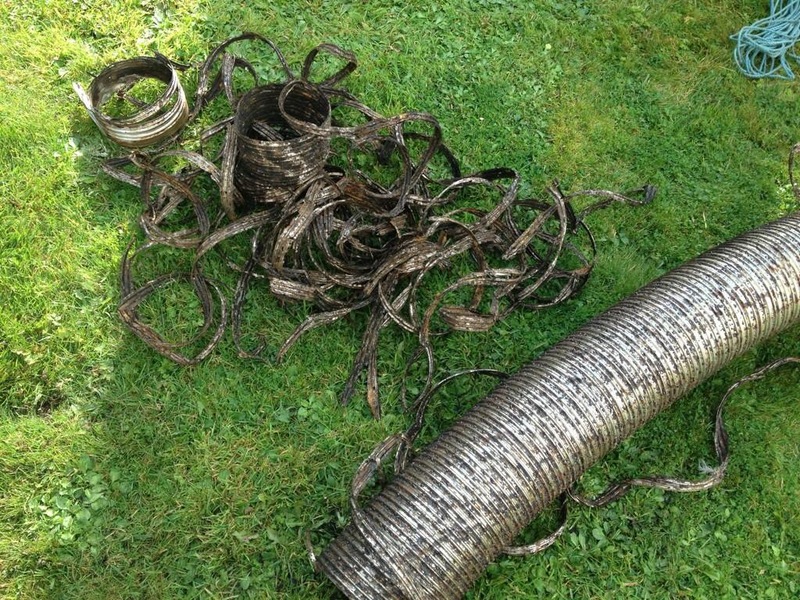 Extend the life of your liner, get into a Spring sweeping cycle like the rest of our sensible customers. Here is a 2 year old liner that has failed completely due to a lack of sweeping and burning the wrong mix of fuel. Get it swept straight after the Winter and leave it clean throughout the year. Have a look at our advisory document on creosote so understand another important reason for sweeping your chimney regularly. You will probably smell the tar or see it running down the walls/flue pipe after rain when it is too late. This Creosote Document tells you all you need to know about why you should avoid this at all costs.